1. Could we start with a basic description of this room and its significance in the realm of Asian architecture? Sure. We're looking at a formal Japanese audience hall—called a shoin (SHO-een). It represents a form of architecture that developed in Japan's Muromachi Period—roughly between the 14th and the 16th century. (1) Tatami mats cover the floor from wall to wall. Prior to that time, tatami floor mats were not used wall to wall, as you see in this room. (1) A single mat would be brought in for the highest-ranking person. But during the Muromachi period, the Japanese began to line their rooms with these tatami mats. The mats are very substantial, consisting of a two-inch-thick core of woven straw, which is covered with a finely woven mat of rush. The edges are bound with fabric—and depending on the formality of the room and the wealth of the owner, this fabric border might expensive silk brocade. Eventually, tatami became an important architectural module. The proportion of the room, the doorways, the height and so on, all related to the proportion of the mats. The overall effect of this kind of mathematical order to Japanese rooms is a feeling of stability and harmony that most people find quite soothing. 2. In the Institute's Chinese Audience Hall, you can see the ceiling rafters. That's not the case here. (2) "Coffered" ceiling, showing 144 mini-squares within larger squares. Right. There are many changes that take place in Japanese architecture with the development of the shoin style. While early domestic buildings in Japan had exposed rafters—and the Chinese, too, maintained this style—the Japanese began to construct suspended ceilings. The suspended ceilings helped create a more human scale to the room, but it also provided an opportunity for decorative elaboration. Suspended ceilings could be simple wooden slats, or—as is the case with the ceiling of the museum's shoin room—it can be coffered. (2) Sometimes coffered ceilings were lacquered and gilded, and outfitted with decorative gilt bronze hardware at the intersection of the railings. So while the great height of Chinese audience halls is impressive, Japanese suspended ceilings create an equally impressive—if different—effect. 3. Another difference is that there's no furniture here. Yes. The other aspect about the proportion of Japanese rooms is that the Japanese have traditionally sat on the floor, whereas the Chinese use furniture. The lower vantage point of the Japanese consequently influenced the development and proportion of architecture. The thickly woven nature of Japanese tatami mats gives them a certain resiliency, making them comfortable to sit and stand on. They also provide a bit of insulation in the wintertime. 4. So, does the practice of sitting on the floor determine elements of the architecture to some extent? Very much so. From a person's vantage point on the tatami mats, the interior would seem cavernous without a suspended ceiling. But other architectural elements were also influenced by the custom of sitting on the floor. 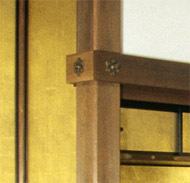 The height of the base of the tokonoma—the alcove for displaying art—raises the object on display to an optimal level for comfortable viewing. 5. What more can be said about how Japanese architecture was moving forward during this period? Earlier in Japan's history, the aristocracy had huge palaces constructed, with large, spacious interiors. These palatial buildings, constructed in the so-called shinden style, lacked a system of dividing interior space—with the exception of portable curtains or folding screens. In the Muromachi era, the Japanese began to conceive of other ways to compartmentalize their buildings to create discreet rooms. By using fusuma—or sliding doors—between pillars, they could create individual rooms. Of course, this was an extremely flexible system. If a larger space was needed, the fusuma could be removed. (3) Square column typical of Shoin architecture. Another aspect of shoin architecture was the squared column. (3) In the preceding shinden style—and in Chinese architecture—structural pillars were typically round. As the use of sliding doors became more prevalent in Japan, it made more sense to square the pillars so that the sliding doors could close tightly against them. 6. So you've described the tatami mats, the dropped ceiling, square pillars, and sliding doors. What else does this room illustrate in terms of architectural innovation? Perhaps the most interesting modification involved the integration of art into shoin architecture. Early on, the Japanese placed a board or low table against one wall where they would display rare art objects imported from China. As shoin architecture developed, however, they began to actually build in a kind of shallow platform to serve this purpose. Eventually, this platform became the tokonoma, a special alcove, where hanging scrolls and other objects were placed. 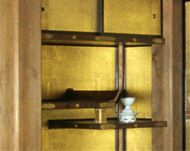 (4) Staggered shelves or chigaidana display art in the alcove. 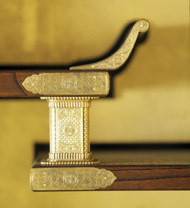 (5) The staggered shelves are joined with ornate hardware. Adjacent to the tokonoma, they also began to build in a special shelving unit called a chigaidana—literally "staggered shelves"—for the display of smaller objects. (4, 5) This built-in shelving unit replaced the freestanding bookcases and cabinets that were popular in China. An interesting cultural difference between the Japanese and Chinese approach to interior design begins to become apparent with the development of shoin architecture. Typically in formal audience halls in China, furniture is produced in matched pairs and arranged symmetrically in the room. In Japan, however, architects enjoyed the asymmetrical relationship of the alcove and staggered shelving unit. 7. Can you tell us more about the Japanese infatuation with Chinese art objects? (6) The raised alcove or tokonoma frames a painting. 8. What can you say about the purpose of this kind of room? Essentially this was a formal meeting area. Similar rooms were built in residential architecture, but also in palace structures, large temples, and so on. This architectural form is called shoin, which literally means a "book room" or a "study," and that's because one of the salient characteristics of this form of architecture was a built-in desk that would have faced the garden. So when the owner was seated at this built-in desk, he could read by the light that would come in from the garden. Very quickly, however, shoin architecture came to designate all of the elements of this evolving form. 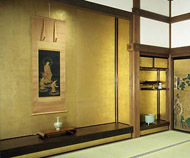 In addition to the built-in desk, it encompassed the wall-to-wall tatami mats, the squared pillars, the tokonoma, the chigaidana, and the sliding doors, as a standard formula for formal rooms. 9. What about this particular room? In this case, we replicated a 17th century audience hall in the Zen temple of Konchi-in in Kyoto. This room served as the formal space where the Abbot received official guests. He would have been seated somewhere towards the center of this room with his back to the tokonoma. The guest would have entered from the other side and would have sat facing him. The tokonoma and the chigaidana, with appropriate art objects on display, would have created a resplendent backdrop. In addition to the objects on display in these areas, beautifully painted sliding doors would have additional visual interest. 10. Anything you'd like to add that you find particularly interesting? (7) A solid piece of elm called zelcova forms the base of the tokonoma. The thing that is really astonishing for me about this room is its fantastic level of craftsmanship. (7) This is constructed out of clear-grain Japanese cedar. Not only is the wood devoid of any imperfections, the carpentry is incredibly precise. And that's part of the aesthetics of these structures—to a Japanese of the era, this would have been a very impressive structure by virtue of its sheer perfection. Every element is very carefully conceived, the materials and craftsmanship are of the highest quality, and the objects on display were rare works of art. So, this room is a tour de force of Japanese craftsmanship. And this is why the wood is left unadulterated. Often in China the wood used for architecture would have been lacquered, thus obscuring any imperfections, in Japan the beauty of the natural material is so admired that every effort is made to expose its natural qualities.